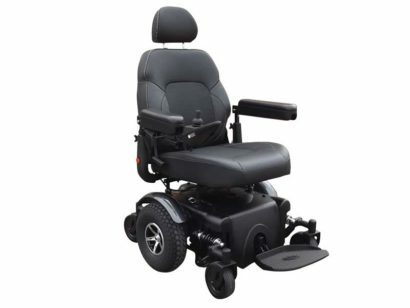 Mid wheel drive with dual in line motors enhanced efficiency which delivers outstanding maneuverability. Unique adjustable suspension design which can give a personalised smooth, stable and safe ride both indoors and out. Comfortable leather feel contoured high back seat with swivel, recline and armrest height and width adjustment. Easy access to tie down points. Drive wheel 12" alloy mag.